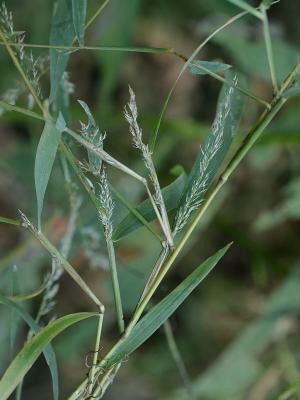 Muhlenbergia frondosa.Gary P. Fleming.Digital 2014. Virginia Botanical Associates, Blacksburg.Atlas of the Virginia Flora.vaplantatlas.org (Accessed 5/2014). Muhlenbergia frondosa is a perennial C4 grass (Smith and Martin 1987), 50 cm to 1 m tall, extensively colonial from rhizomes, plants dull bluish-green, stems at first erect, simple, later freely branched from base or middle nodes, branches forking, often bushy, sprawling, internodes smooth, shiny, sheaths loose, compressed laterally; ligule about 0.1 cm, membranous, fringed with bristles. Leaves alternate, 4-12 cm long, 0.2-0.7 cm wide, lax, soft. Flower spikelets usually 1-flowered, about 0.3 cm, glumes 0.2-0.4 cm, narrow, somewhat unequal, lemma usually 0.3 cm, often awned to 1 cm long; inflorescence contracted, terminal and axillary, to 10 cm long, 1 cm wide, the axillary ones partly hidden in sheath, branches of terminal inflorescence loose, open, flowering to base, often purplish; Aug.-Oct.
Habitat: Part shade, roadsides, woods, soil pH 5.9-7.9 (USDA, NRCS 2010).